“Ron Johnson is broadly credited with building out Apple’s insanely profitable retail store business,” Covester reports. MacDailyNews Note: Watch Ron Johnson and Michael Francis present J.C. Penney’s new strategy here. Steve Jobs’ influence has only just begun. I’m disappointed Ron left Apple, but I’m impressed with what he’s done at JCPenny so far. He has really made some bold moves – all of them great choices. I wish him nothing but success! What usual business schools teach is evil. Thanks to Steven and now Ron business might regain basic sense. I would be willing to bet that there are many other senior management people in Apple who will migrate to other industries in the future. This migration of people who are willing to challenge existing models and who want to make things better could be a real benefit to American industry. I suppose the argument could be made that the culture of Apple (as developed by Steve Jobs) may have far reaching and (hopefully) positive effects for the US for many years to come. Good point. Innovation comes in waves and a single unique solution for one problem can be applied to many different situations with great effect. The only way first world countries can stay ahead of the game is by being the first to innovate. That sadly is lost on the traditional industries but they too could enhance their products by thinking differently. Not that I shop regularly there, but there is a noticeable change in the air at JCP stores. Even the employees are pumped in a way that they haven’t been for many years. Their prices are decent, no more headaches with coupons, and the one store we go to is cleaner and laid out more efficiently. I’m impressed. Reason #1: more moolah. End of story. 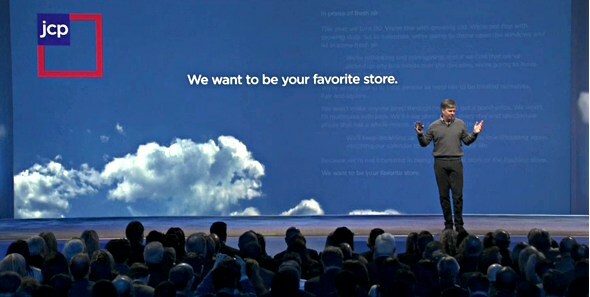 Love Ron’s work, love what he did for Apple, believe in what he’ll do for JCP. But is it just me, or is it hard to get very excited listening to him present? I know, Steve’s a tough act to follow. But seems he could use some coaching! And some coffee! That JCP video shouldn’t be in Flash. Guess Johnson got bored with “Changing the World” and returned to pushing mediocre clothing. Go figure. At least it’s better quality than Walmart. They must pay him a Hell of a lot. Has anyone here been to a revised JC Penny store? What’s changed? What’s new? I have an affinity to shopping. Was “damaged” as a child by mother, who was born to shop. I know, most here probably can say the same but she wrote the book. I remember one time, when I was very young, she took me to the mall to get shoes and to get the shoe store we went through one of the anchor stores at the mall. It took an hour just to advance from the first few aisles from the front door. As a kid wanting to get in and get out, this was worse than any advanced interrogation techniques like water boarding. To this day, I get cold sweats just passing a mall!